C2 Covalent’s speed and flexibility makes for happy customers and heroes out of your lending team. C2 Covalent helps financial institutions make fast, consistent, high-quality credit decisions in an easily-deployable, cloud-based Loan Origination System (LOS). For your associates, this means consumer and small business loan origination with robust regulatory compliance and significant cost savings. For your customers, it means a more seamless and efficient point of sale experience through additional product offerings, and lending decisions that are made within minutes. You get access to the data that you need to make fast, consistent, high quality Consumer and Small Business credit origination decisions in the shortest possible time. Unlike outdated software intended for centralized use, C2 Covalent was natively designed and built to provide secure transparent access on desktop and mobile devices. Our legal document preparation process and partnerships provide highly-trusted built-in compliance with state and federal regulations. Your analyst – your rules! When your lending policy changes, you’re able to modify the loan origination automation process without getting software developers involved. Our system is so intuitive that your associates will have near instant usability. In the time it takes to open the bank in the morning, you can have your users trained on the system. Interfacing to your CORE system has never been more efficient and error-free with C2 Covalent’s integrated connectors. Why not leverage Microsoft’s expertise and their highly-available, highly-secure SOC 2 compliant Azure cloud so that you can sleep easy at night. With C2 Covalent, you can deploy strategies to serve more of the financial needs of your customers with prequalified offers. It really is the best of both worlds. C2 is the only firm that combines connections to all of the vital third-party data sources with a flexible mapping tool, characteristic builder, and rules engine that enables quality, quick, consistent, compliant decisions. We allow you to create a customer experience that matters. Not just a quick decision – the right decision. And targeted product offerings. All while they’re still sitting across from you. With C2 Covalent’s key partnerships, we provide connections to all of the vital third-party data sources. Updates included. Lenders love C2 Covalent’s instant usability, predefined product types and modules. Spend less time on training and more time on the customer relationship. C2 provides modules for regulatory and compliance monitoring. C2 also manages and maintains rules within these modules and provides updates as regulations change. Flexible reporting, increased customer share of wallet, and significant time savings for your analysts. It all adds up! And actually – it multiplies. 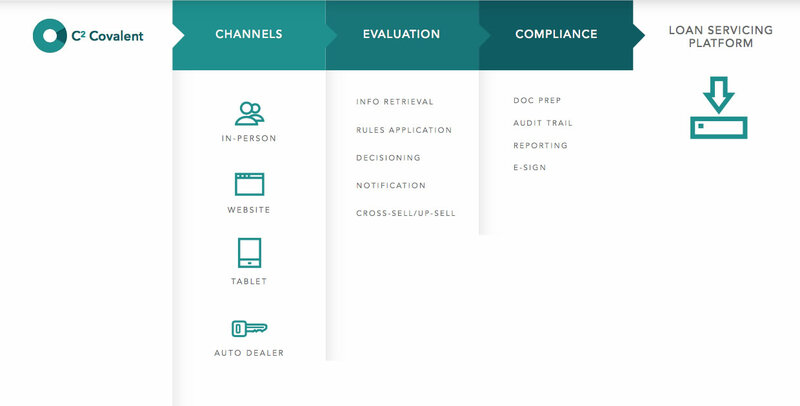 The C2 Covalent ecosystem includes tools that can be utilized from point of sale, through underwriting and doc prep. Covalent connects to all of the vital third-party data sources for the various types of consumer and small business lending you do today. And through our automation layer architecture, new data sources of tomorrow can be easily integrated so that you always stay current. All of these components can be combined to create the workflow and level of automation that is custom fit for your institution.